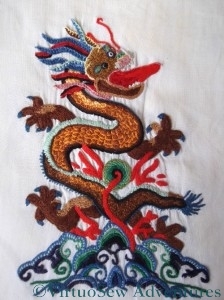 This wonderfully contorted Imperial Dragon was another Needlewoman Magazine design (March 1934), and he got his name from the Golden Hours of Kai Lung, by Ernest Bramah, which I was reading at the time, because it had been mentioned in one of Dorothy L Sayer’s books (“Strong Poison”). The pearl cotton I used was really too heavy for the base fabric – another old piece of linen – but it gave a fantastic lustre to his scales, which were worked using nested fly stitches (not my idea – I followed instructions on this piece!). The tongue is closely-set stem stitch, the claws are fly stitch (so are the teeth – I think the designer liked fly stitch!) and the mane is made of interlocking blanket stitch. I worked very hard on this piece, to keep the stitches neat and even, and I used to take it with me to visit Grandmama when she was in hospital. There’d probably be a riot now if I sat at a hospital bedside, embroidery in hand, but Grandmama enjoyed watching me work and made a lot of useful and encouraging comments as well. The magazine no longer had its transfer of the Dragon, which was intended as a Firescreen (other suggestions included the back of a bridge coat, a footstool, a cocktail tray, a cushion…), so I worked it at the size of the diagram in the magazine, on the back of a dress. Had I worked him full size, he’d have been too big for the dress. I was thrilled when the wife of one of my father’s friends recognised it, told me that she had worked it herself when the magazine came out, and fished out the firescreen she had made using the design the next time we went to see them. She was the person who told me that you can tell he’s an Imperial Dragon, because he has five claws. She’d worked it in pastel shades to go with their drawing room of the time, and it was absolutely stunning. She and her husband are both dead now. I do hope that that screen found a happy home!